Shortly before Thanksgiving day the North American Rare Bird Alert posted the finding of a Ross’s Gull at the Gavin Point Dam area on the Missouri River near Yankton, SD. This was the first ever reported sighting in Nebraska and the second ever in South Dakota. The Iowa Bird Line picked it up and sent out an alert to its subscribers suggesting that a trip across the border might be in order to see this rare “lower 48″ visitor. Shortly before noon on Saturday I drove to Yankton, arriving around 3:30. I searched for the Ross’s among the flurry of Bonapartes and Ringbilled Gulls air-fishing in the tailrace below the dam. No luck. I drove across the dam and turned right, toward a complex of frozen ponds. There several birders had their scopes lined up looking at the Ross’s Gull, which was sitting on the ice in the midst of a flock of Ringbills and Bonapartes. I am learning that one of the best strategies for finding rare birds is to first look for the rare bird searchers. The Gull was very cooperative as it sat and walked on the ice for nearly an hour. It then flew off into the sunset so I was unable to get a good view of it in flight. However, the sitting and walking views were satisfactory. The bird was clearly pink on the breast and belly. The black ring band on the back of the neck was not present, as is to be expected in a winter bird. It looked a lot like a little seal with its round, white face with large black eyes and black bill as it sat on the ice looking directly at us. The eyes seemed unusually large for a gull. I was happy to add this bird to my Life List as number 692. I have considered travelling to the Churchill area in northern Manitoba to view the Ross’s Gulls that have been seen there in recent years, (although in very limited numbers now) but it was much more convenient to drive to Yankton from Des Moines. While chatting with the other birders who were looking at the Ross’s, one of them mentioned that a Little Gull had been seen at the Oahe Dam north of Pierre, SD. I decided to extend my visit to SD and stayed overnight at Yankton. I left for Pierre about 4:00 a.m. the next morning. I arrived about 8:00 and after a quick breakfast, began my search for the Little Gull. At first, the only gulls visible were too far out on the reservoir to identify. I looked down-river and around the dam, with no luck. About 10:30, the gulls started moving and I was able to locate the Little Gull on an ice-covered pond very near the power plant, just below the dam. It was nestled on the near side of a large flock of resting Ringbilled Gulls, Bonapartes Gulls, one Black-legged Kittiwake and one Glaucous Gull. The little Gull was very close to the West Tailrace track, so the view was excellent. It was easily distinguished from the sometimes confusing Bonapartes because of its much smaller size. It was a first-winter gull, with a lot of black on the wings. This became my North American Life Bird number 693. 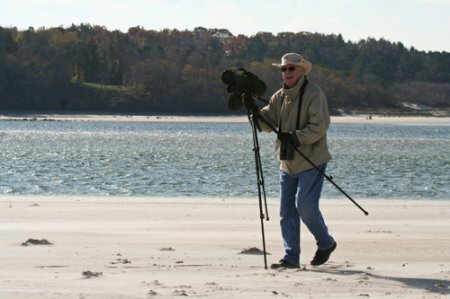 I have previously searched for Little Gulls reported once in Dickinson County, IA and annually by Lake Michigan in Manitowoc, Wisconsin, without success. The 700 magic number is getting surprisingly close. I doubt that I will reach it in 2010, but with any luck, 2011 will be the year. These two gulls were high on my list of “Want to See”, so it felt like an early Christmas present. I guess I fit right in with the Black Friday/Saturday mad shoppers, only I don’t have to wait in line for the stores to open. 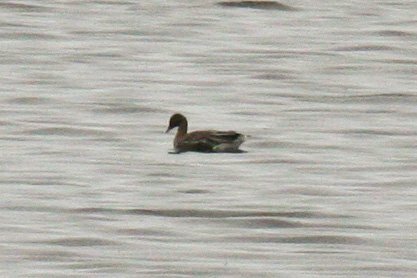 A week or two ago the North American Rare Bird Alert reported that a Pink-footed Goose had been seen in the area east of Moncton, New Brunswick. This was the first reported sighting of this species in New Brunswick, and very few of this Arctic and northern European species have been found anywhere in North America. With plenty of time on our hands, we decided to go there to try to find it, so last week we made the trip. The weather in New Brunswick had been terrible for several days with lots of rain and fog, so our flights were often delayed. Ultimately we arrived in Moncton in heavy fog. The next morning was gloomy, but the rain was temporarily gone. We drove out to the little community of Corvierville. Within an hour or so we spotted the Pink-footed Goose on the water, not close, but easily viewed through my scope. 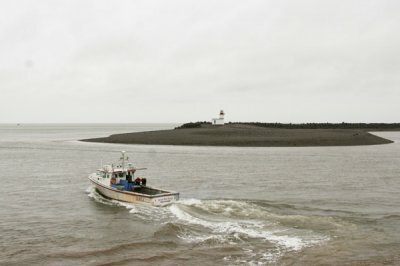 Having seen the goose relatively quickly, we decided to drive to Prince Edward Island. 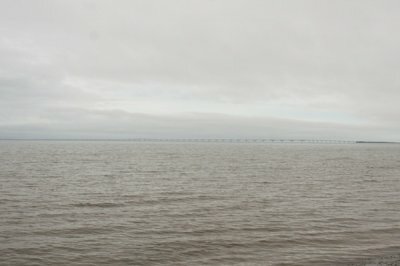 We crossed the Confederation Bridge to the Island and drove to Charlottetown, the capital of the province. 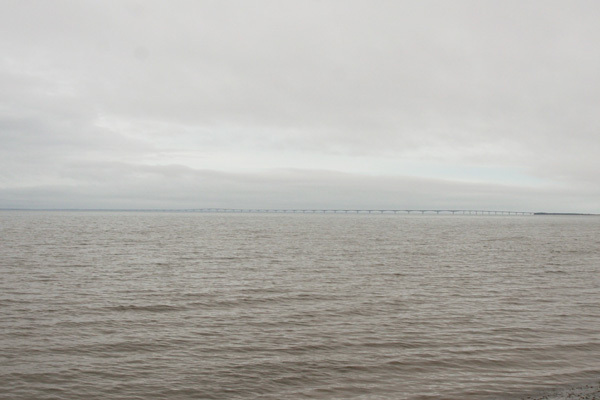 The Bridge is the longest bridge in the world across ice-covered water, and the 7th longest bridge in the world. A toll of $43.50 is payable when you cross back over the Bridge to New Brunswick. Prince Edward Island is a very pretty area, with agriculture surrounding the capital city. We enjoyed a pleasant evening out at a very nice restaurant in down-town Charlottetown. The next morning the rain was quite heavy. We drove back across the bridge and down to Nova Scotia. There we drove to the Bay of Fundy for a view of this area of great tides. Then, after many more delays, we flew to Montreal, and, the next morning, to Des Moines. 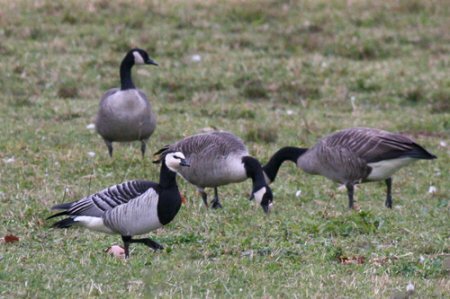 A national rare-bird hotline has been reporting a number of sightings of Barnacle Geese in various parts of northern New England. This seems to be a big year there for Barnacle Geese, which are seldom seen in North America. Barbara and I flew to Boston last week to seek and photograph one. But first, we took advantage of our proximity to Boston’s Symphony Hall to hear the Boston Symphony’s Saturday night performance of compositions by Bach, Adams, Prokofiev and Bartok. Symphony Hall was constructed more than 100 years ago in central Boston. It still claims a ranking as the best acoustical venue for orchestral and symphonic music in the United States, and third in the world. The sounds we heard justify the claim. But just as impressive as the Boston Symphony and the music it produces, is the building itself. If any of you ever get a chance to spend time in Boston you should see Symphony Hall, even if there is no performance in process. The building and its interior are worth a visit. If there happens to be a performance and Bartok is on the program that day you might want to skip that, however. We stayed in Concord the first night and took the “T” back into downtown Boston for the performance. As it was Halloween, the train was filled with costumed revelers, probably from the various colleges and universities which line the route. For $2, you can’t beat the ride and the convenience. The party atmosphere added to the ambiance. The next morning we drove a very short distance from Concord in search of the Barnacle Goose being seen at the Prison Fields near Concord. It was not long until Barbara spotted one among a large flock of Canada Geese (my North American Life Bird # 690). So now we could come home, right? Not so fast. In addition to the Goose, there had been some reports of another rarity being seen on Plum Island, an hour or so drive north of Concord. After viewing and photographing the Barnacle Goose, we drove to Plum Island. It was a beautiful drive. The fall colors north of Boston are far more vivid than they are here in Iowa and there was a surprising amount of foliage remaining in the trees. Plum Island is a barrier island but with considerably more vegetation than we have been accustomed to during our many sojourns on Padre Island. The north wind became very fierce, driving fine sand as we spent several hours tromping around the beach and wetlands in search of our second rarity, a Curlew Sandpiper. We gave up (wore out) and headed back up the island for a late lunch at a small, local diner. Our efforts to find the Curlew Sandpiper continued the next day, with somewhat more tolerable weather, but again without success. This Herring gull flew by with a closed clam which it dropped on a rock. 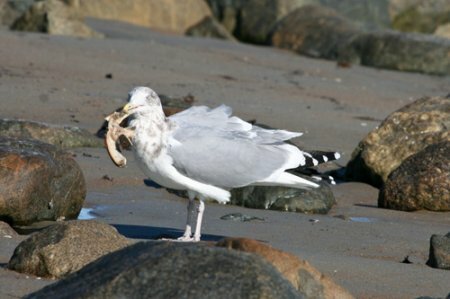 The shell broke, and the gull consumed the contents. We then drove to Gloucester in search of another possible lifer mentioned by a helpful birder we met at Plum Island. This bird, the Purple Sandpiper, although not rare in the east in winter, has eluded me for years. 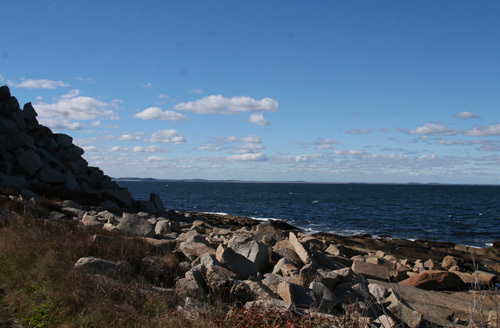 It still eluded me, but the afternoon spent on the rocks at Haddock State Park near Gloucester, overlooking the Atlantic Ocean, was most enjoyable. We were treated to a close-up view of 3 first-of-winter Snow Buntings, lazing about on the rocks, but they flew away before Barbara could get a picture. Gloucester was first settled in the early 1600s. It is the oldest seaport in the United States. It has a somewhat down-at-heel appearance these days.